One million patients are searching for healthcare and medical services online in South Africa every month. If you’re a healthcare practitioner who wants to reach more patients with an online presence, but don’t have the time to keep up with the latest digital and SEO trends, then the Solumed Pro / RecoMed offering is an ideal solution for your practice. What does a Solumed Pro RecoMed profile offer? The Solumed Pro RecoMed offering gets you and your practice online for patients to easily find and book appointments in real-time. These appointments are then integrated back into your Solumed Pro online calendar where you have the control to accept or decline. 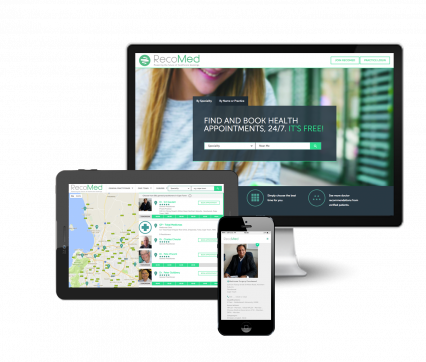 You will also be listed on RecoMed’s partner channels (directories, schemes, life insurers) to gain additional exposure and increase patient visits by maximizing your availability. BONUS! Sign up now and get your first 20 appointments free! Solumed Pro has been built on the latest technology. The multi-tiered application allows for scalability in different medical environments. Solumed Pro is extremely user friendly with a fresh new look and the ability to run on both Local Area Network and Wide Area Network environments.